My teeth have always been a big, big issue for me because I have Oligodontia - a genetic condition which means I have a large number of missing teeth - many of my secondary teeth are simply missing, it's not anything I did or didn't do. 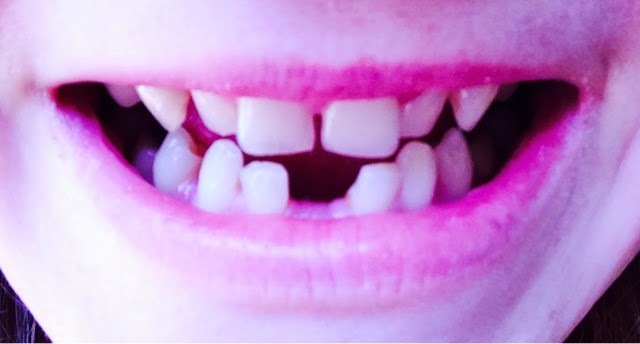 Milk teeth fall out when a growing secondary tooth pushes it out, for me I have many gaps where a neighbouring secondary tooth pushed out a milk tooth where there wasn't a secondary tooth leaving a lot of gaps - I also still have a few milk teeth! I found growing up with the gappy teeth a problem as I got picked on for it, I found myself to be timid and often I'd talk behind my hand or hair, or at secondary school I just didn't say much at all. I find I'm judged on my teeth - living in London with a Lancashire accent and awful teeth automatically give people assumptions over the sort of person I am. I've always wanted that Hollywood Smile, more so on my wedding day - I cringe at the photos that show my gappy smile, I want to fill in the smile with a pen! ohhh I'd love to have my teeth sorted! Because of Oligodontia, I take an active interest in cosmetic dentistry, I've had a few quotes before to have everything sorted in one go, involving long painful procedures such as drilling, tooth removal, veneers and implants and I've become very tempted before - the last quote I had to totally give me the Hollywood Smile I crave, somewhat exceeded my current affordability so its something I'd look to improve slowly, step by step - ideally before I reach 40! I was excited to see Sensu, One of London's leading dental studios set in the heart of the Harley Street District offering Invisalign Braces I wonder if these invisible braces would help me to rectify some of the gaps and twists I have. They sound impressive and don't have the traditional fixed look other braces have. The Invisalign Braces are a progressive set and as the name suggests, extremely discreet. with the added bonus of being removable so you don't need to worry about teeth cleaning and food issues as you would with a fixed brace. I had a good browse through the Sensu website and spotted a few things that might be able to assist me in correcting my teeth - its something that I would love to be in the position to do, you wouldn't believe the amount of times having Oligodontia has reduced me to tears - something as simple as having a good smile can make all the difference to a person's confidence and wellbeing. Would you change anything about your smile? Hi Emma! I came across your post while looking up "Oligodontia" online because I have it as well, and had just discovered there was a special term for it. My name is also Emma! I went through the braces process and am currently waiting until my jaw is mature enough to get bridges and/or implants or something, but have just found out that my bite might need to be fixed before this because most of my top and bottom teeth don't touch.... Also, I have some milk teeth, none of them have come out yet, but are threatening to any day now. Anyway, I can absolutely relate to the last thing you said in your post. I have become quite used to my teeth now, but every once in a while will become frustrated. Anyway, I hope you are doing well (I realize this was posted quite a while ago) and greetings from America.